If LeBron James elects to return to the Cleveland Cavaliers, many changes will be made to better the team. According to former Cleveland Browns star Josh Cribbs, one of those moves may be a bigger splash than anticipated, with the Cavs bringing on Russell Westbrook. Is Cribbs a revered source of breaking basketball news? No. Is this scenario even remotely plausible? Probably not. Would it be awesome if the Cavs could somehow pull this off? Absolutely. 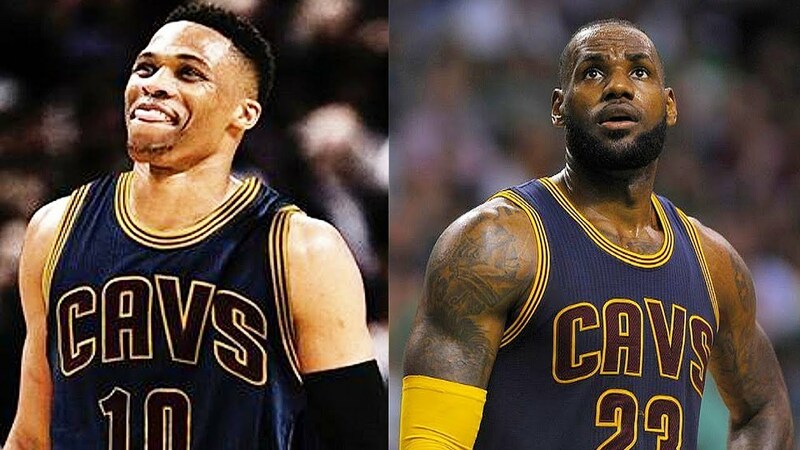 Lets break down how Cleveland could pair Westbrook up with James. The first order of business is making sure that James stays in Cleveland. He will most likely opt out of his contract this offseason in order to sign a new one, either with the Cavs or a different team. If James re-signs with the Cavaliers, the team could pay him up to $41 million per season. Normally, this would cause a fairly significant salary cap problem, but because Cleveland is already so far above the cap, this new contract wouldn’t change things much. A two-year $82 million contract with a player option for the second year is realistic, unless James wants to commit to the Cavs long-term and sign a five-year deal worth a staggering $205 million. Step two is to give the Oklahoma City Thunder incentive to trade Westbrook. Under normal circumstances, OKC would laugh at just about any offer. After all, Westbrook is in the prime of his career, he’s under contract through the 2022-2023 season, won the MVP award in 2016-2017, and just averaged a triple-double for the second consecutive season. But in this hypothetical universe, James and Westbrook would have had a conversation in which they decide that they are dead-set on playing together in Cleveland. Westbrook goes to Thunder GM Sam Presti and informs him that he wishes to be traded to the Cavaliers, and if he is not, he will sit out the season for the Thunder. Petty? Probably. Realistic? No. But, it works for this situation. Not wanting to pay Westbrook $30 million to sit on the bench and destroy the locker room culture, Oklahoma City engages in trade talks with the Cavs. Cleveland owns all of the leverage here, but in a surpsie move, the Cavaliers decide to help the Thunder out. Cavs GM Koby Altman had leverage over the Los Angeles Lakers but still gave them a first-round draft pick in addition to complying with all of their requests: cap relief in exchange for Jordan Clarkson and his contract. Altman could match salary and then offer the Thunder a bag of chips if he wanted, but that’s not what he does. Carmelo Anthony decides not to terminate his contract early, leaving OKC with his $27 million contract for next season. The Thunder don’t want to pay this in a vacuum, and especially not if Westbrook is gone. Westbrook cannot be traded until the end of September due to his contract extension, so the Cavs choose the player that the Thunder want at #8. Hill and Smith don’t fit with OKC’s new timeline, but their contracts are almost entirely non-guaranteed, so Oklahoma City can cut them and not have to pay nearly as much. Salary-wise, they are much better off for the future. And with Cedi Osman and the rookie, the Thunder will have a nice start to their rebuild. The Cavaliers would have completely gutted their depth. Thompson’s departure would leave Larry Nance Jr. and Ante Zizic as the only big men on the roster. The loss of Smith leaves the starting shooting guard position open, with the most likely candidate to fill it being Rodney Hood, if he is re-signed by the Cavs. A new backup point guard would need to be found, unless the team is content with Jose Calderon. The projected starting lineup would be Russell Westbrook, Rodney Hood, LeBron James, Carmelo Anthony, and Kevin Love. Anthony would be better suited coming off the bench, but his ego won’t allow that. If he plays like he did last season, things won’t go so well for this team. It would take a while for this group of players to gel, but in the playoffs, if all are motivated and playing well, they will be incredibly difficult to stop because of how versatile they are. All five players would be able to score off the dribble, drive to the basket, and knock down three-pointers. In order to get Westbrook, the Cavs would be forced to give up their future while descending even deeper into cap hell. But, if this team wins a championship (and they very well could), it would all be worth it.